I noticed my rosemary bush was full of blossoms the other day and my first thought was honey cake! 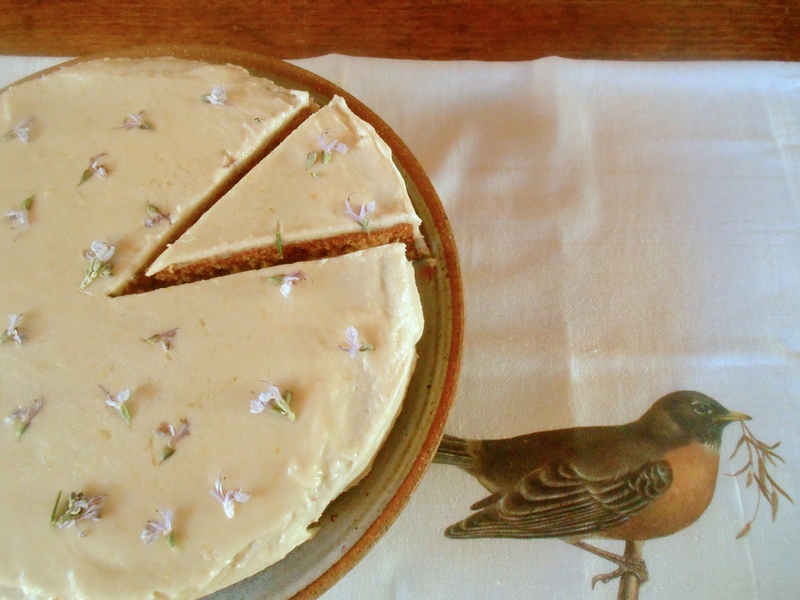 Tessa Kiros suggested making this cake when you are lucky enough to have tiny purple flowers on your rosemary bush so you can scatter them over the finished cake. And she was right. This comes from her book “Apples for Jam”. We love this honey cake. It is dense, moist, heavily flavored with honey and a hint of rosemary. The frosting is simply butter, lemon and powdered sugar. I have been making this cake for years and finally, this is the first time I have timed it right with the rosemary blossoms. Goodbye winter, hello spring! All week I have been waking up to the song of robins. It is my understanding spring begins at the first sound of a robin’s song. Perhaps it has to do with the vertical migration of the earthworms once the ground has thawed. Grease and line the bottom of an 8-1/2 inch springform pan. Put the butter, brown sugar, and honey in a small saucepan and add 1 1/2 tablespoons of water. Heat gently, stirring once or twice, until the butter melts and the sugar dissolves. Leave to cool for 15 minutes. Preheat the oven to 350°F. Sift the flour, baking powder, and cinnamon into a bowl and add the rosemary. Add the honey mixture and eggs and beat until smooth. Pour into the pan and bake for 35-40 minutes, or until a skewer comes out clean when you poke it into the center. Leave in the pan to cool completely. To make the frosting, sift the confectioners’ sugar into a bowl. Add the butter, lemon zest and juice, and 1-1/2 tablespoons of water and beat until smooth. You might like to add a few more drops of lemon juice after tasting it. Spread over the top and sides of the cake. The cake softens as it sits and will keep well for up to a week in a covered container. You are currently reading honey cake at COTTAGE GROVE HOUSE.